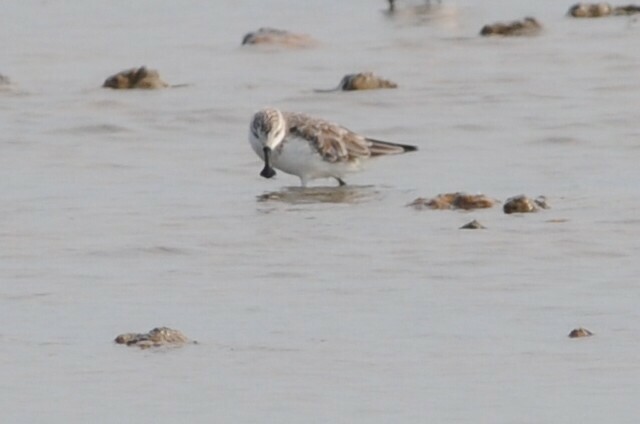 A record 103 Spoon-billed Sandpipers were recorded at a new site within the Rudong mudflats in China last week. The estimated total adult population worldwide is thought to be less than 300, meaning that the site is used as a stopover by about a third of the world's population. However, plans to redevelop the site may have serious impact on the suitability of the area for Spoon-billed Sandpipers, plunging the birds' future into further danger. Declining by a rate of a quarter each year, the Spoon-billed Sandpiper could be extinct within a decade unless action to halt development on the bird's flyway is taken. Members of the Shanghai Wild Bird Society (SWBS) were responsible for the find and have been financially supported by the East Asian Australasian Flyway Partnership (EAAFP). Tong Menxui from the SBWS discovered the unusually high numbers over a series of days, peaking at 103 on 12th October. He said: "The sudden cold spell and bad weather might have triggered the birds to stop migrating further so the birds are assembling on Rudong before crossing larger distances. Among the flocks were only two juveniles, which are known to migrate separately and usually later. We intend to continue to monitor the site for more birds passing through over the coming days and weeks." The Spoon-billed Sandpiper is threatened by loss of essential intertidal feeding sites along its 8000 km migration route from Russia to its wintering grounds in south and southeast Asia, and also by trapping on its non-breeding grounds. While these issues are being tackled by the joint efforts of the Spoon-billed Sandpiper Task Force, a programme has begun to create a captive breeding population of the bird in the UK. An emergency rescue mission to save the species got underway in May. A partnership of conservationists, including experts from the RSPB, Birds Russia and WWT, travelled to the remote far east of Russia to take eggs and hatch them in captivity. The birds will soon be brought to the UK where they will be part of a captive breeding programme. It is hoped that offspring of the birds will be used to supplement the wild population in years to come. The conservation-breeding programme is just part of an international campaign to save the Spoon-billed Sandpiper that will benefit many endangered species that use the same migratory flyway. The RSPB and Birds Russia, together with BirdLife International, WWT and the BTO as well as other partners in the Spoon-billed Sandpiper Task Force, are encouraging governments to conserve the most important wildlife sites, and to recognise their great natural value to human society. Christoph Zöckler, the Coordinator of the EAAFP Spoon-billed Sandpiper Task Force, said: "These are very exciting findings and I congratulate Tong Menxui on finding such a big flock. The fact that so many of the world's population of Spoon-billed Sandpipers have been spotted here means this site is extremely important to them. Immediate and urgent action is required to stop any further development and to protect the intertidal mudflats in Rudong and at other sensitive areas on the Chinese coast, such as the Minjiang Estuary, in order to prevent the extinction of this and potentially many other species for which this area is of great significance. This is an opportunity for China to lead the way, just as the country has with its work to save the Giant Panda. By simply safeguarding this site, the Chinese Government could do more for the future of this endangered bird than the rest of us put together."